Posted by judylobo in Birds, Nature, photography, Sea Ducks, Wildlife, Zoo. It is lovely weather for ducks. Especially the sea ducks that can be found at the Central Park Tisch Children’s Zoo. A glorious display of Harlequins, Chinese Mergansers, White-winged scoters, Baikal teals, Pacific Common Eiders, White-headed, Lesser Scaups, and my favorite, the smew. Check them all out below in this week’s continuing winter montage series. Don’t forget – today starts the first of four early opening hour Sundays for photographers at the Central Park Zoo. Get your tickets at 9 AM at the gate and enjoy the Zoo an hour before opening to capture the beauty of the Zoo’s collection. I’ll be there. 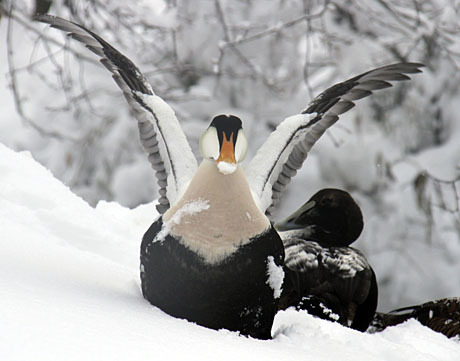 Check out the eider duck feeding frenzy video I found on youtube below.